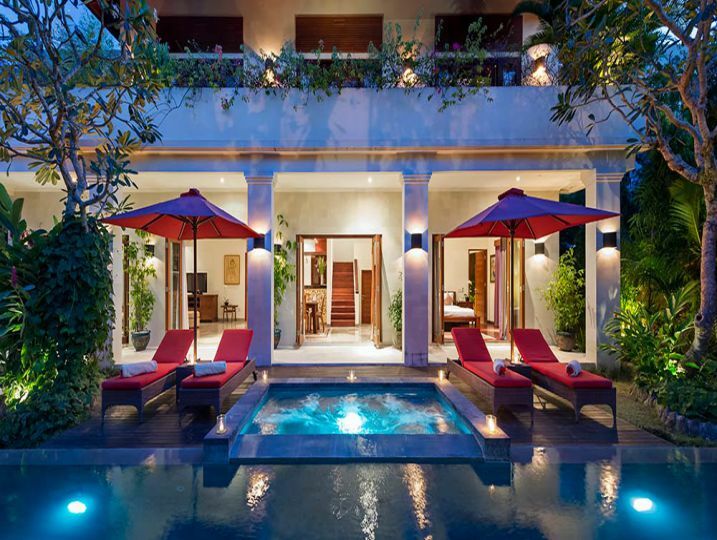 Villa Kalimaya is a complex of four immaculately presented private villas, each with a swimming pool set within its own privately walled tropical garden (three with jacuzzis). 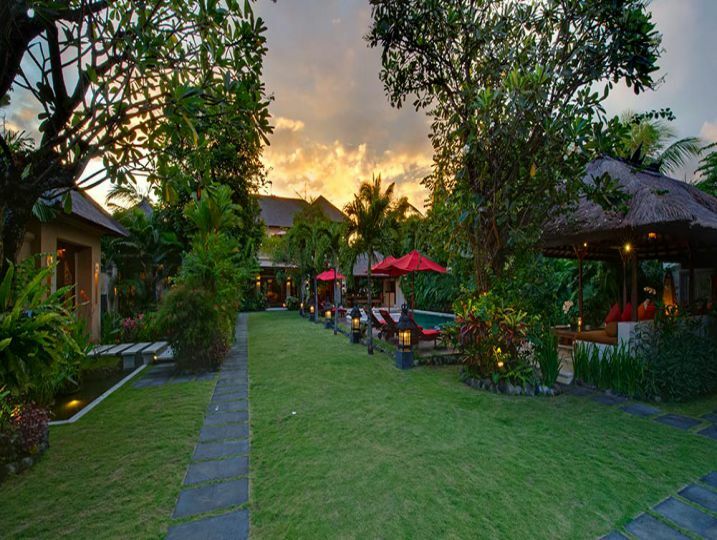 The villas all lie down a quiet lane moments from the beach in central Seminyak. When all four properties are hired together, Villa Kalimaya can sleep up to 28 guests , making them ideal for groups of friends, couples and families who wish to spend time together on holiday yet also benefit from their own private space. 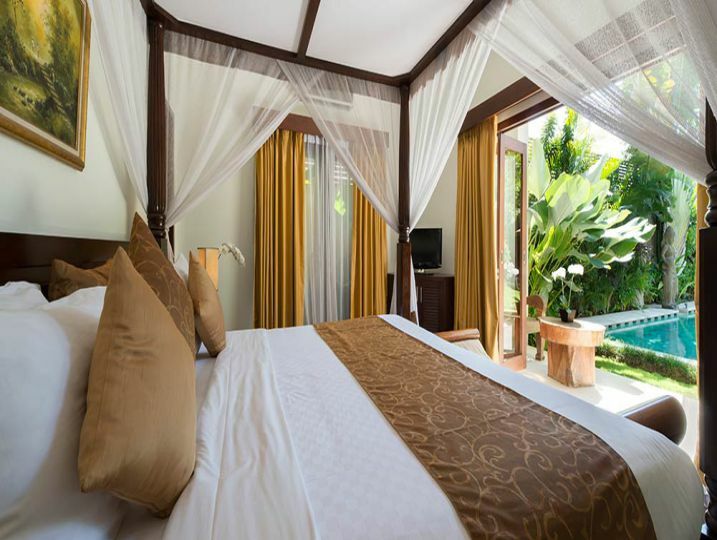 The villas are beautifully appointed, exuding luxury, elegance and comfort. 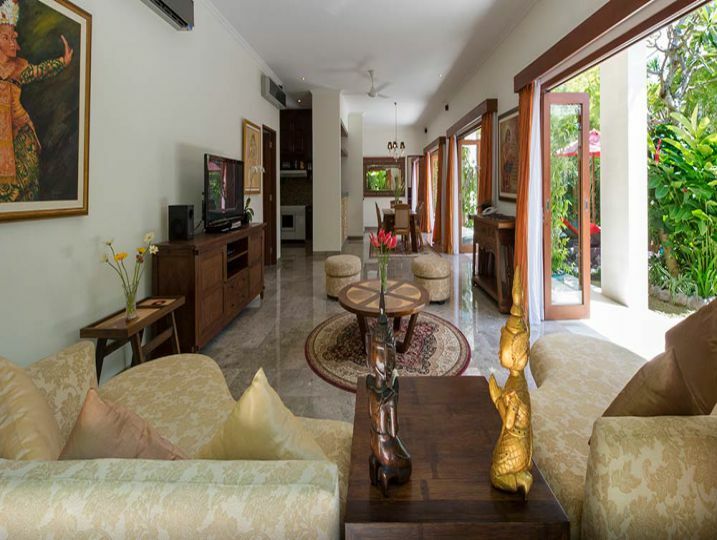 Each is equipped with flexible living and dining areas set in lush tropical gardens. WiFi is available throughout, as are iPod docks, plasma TVs and DVD players. Guests are pampered by a professional, highly trained team of staff whose first-class service captures the very essence of Balinese hospitality. A manager is on hand to assist with all enquiries, villa attendants provide a discreet service and keep the villas in immaculate order, and a dedicated kitchen team, headed by an experienced chef, prepares restaurant-quality food at reasonable prices. 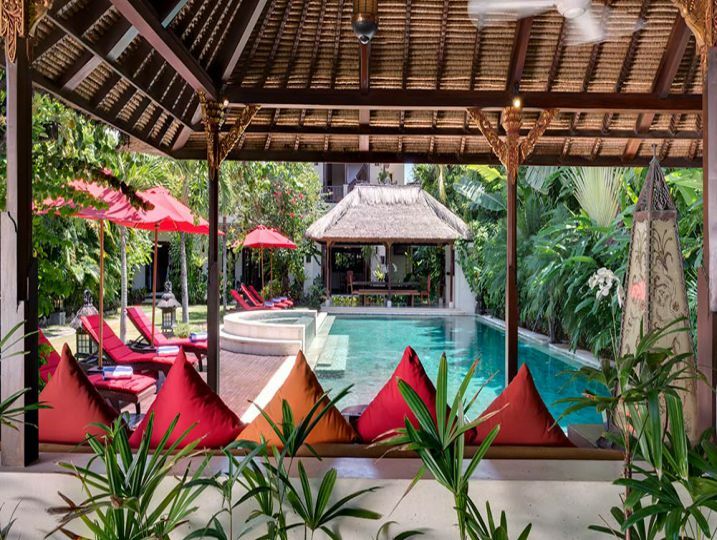 Beyond the walls of this serene and private tropical sanctuary, guests can revel in sophisticated Seminyak, and its dazzling array of restaurants, bars and boutiques, not to mention its glorious sunset-facing beaches and world-class surf. The sports and leisure facilities of Bali’s exclusive Finns Recreation Club are also available to guests throughout their stay (limited daily passes are shared by estate guests). Main Living Area (Semi open-air living area, Air-conditioning, Television with international channels & DVD player, HiFi sound system, Guest bathroom). Bedroom 1 (Ensuite bathroom with bathtub, King size bed, Air-conditioning, Television with DVD player, Music docking station, Toiletries, Wardrobe, Terrace outside bedroom). Bedroom 2 (Ensuite bathroom with bathtub, King size bed, Air-conditioning, Television with DVD player, Music docking station, Toiletries, Wardrobe, Terrace outside bedroom). Bedroom 3 (Ensuite bathroom with bathtub, King size bed, Air-conditioning, Television with DVD player, Music docking station, Toiletries, Wardrobe, Terrace outside bedroom). Bedroom 4 (Ensuite bathroom with bathtub, King size bed, Air-conditioning, Television with DVD player, Music docking station, Toiletries, Wardrobe, Terrace outside bedroom). Bedroom 5 (Ensuite bathroom with bathtub, King size bed, Air-conditioning, Television with DVD player, Music docking station, Toiletries, Wardrobe, Terrace outside bedroom). Bedroom 6 (Ensuite bathroom with bathtub, King size bed, Air-conditioning, Television with DVD player, Music docking station, Toiletries, Wardrobe, Terrace outside bedroom). Bedroom 7 (Ensuite bathroom with bathtub, King size bed, Air-conditioning, Television with DVD player, Music docking station, Toiletries, Wardrobe, Terrace outside bedroom). Bedroom 8 (Ensuite bathroom with bathtub, King size bed, Air-conditioning, Television with DVD player, Music docking station, Toiletries, Wardrobe, Terrace outside bedroom). Bedroom 9 (Ensuite bathroom with bathtub, King size bed, Air-conditioning, Television with DVD player, Music docking station, Toiletries, Wardrobe, Terrace outside bedroom). Bedroom 10 (Ensuite bathroom with bathtub, King size bed, Air-conditioning, Television with DVD player, Music docking station, Toiletries, Wardrobe, Terrace outside bedroom). 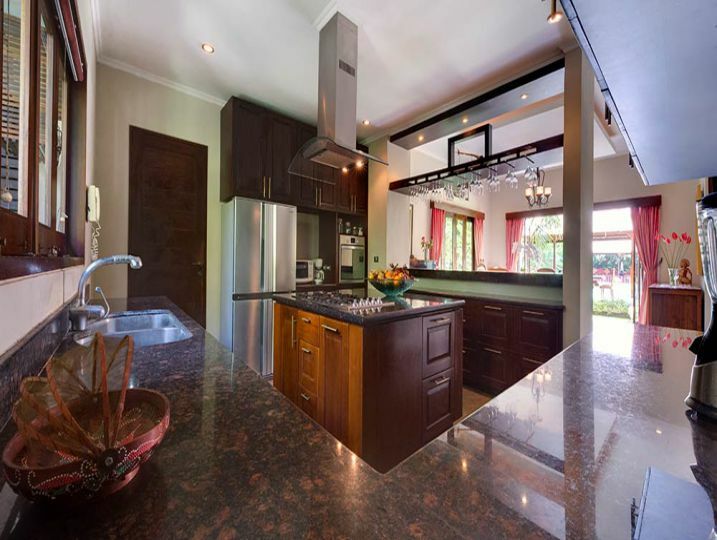 Kitchen and Dining (Semi open-air kitchen & dining area, Fully equipped kitchen). Communication (Free WiFi internet, Telephone with free local calls). Miscellaneous (Baby cot & high chair available, Back-up power supply (e.g. Generator), Ipod Docking System). Property Outlook (Swimming pool views, Garden views). 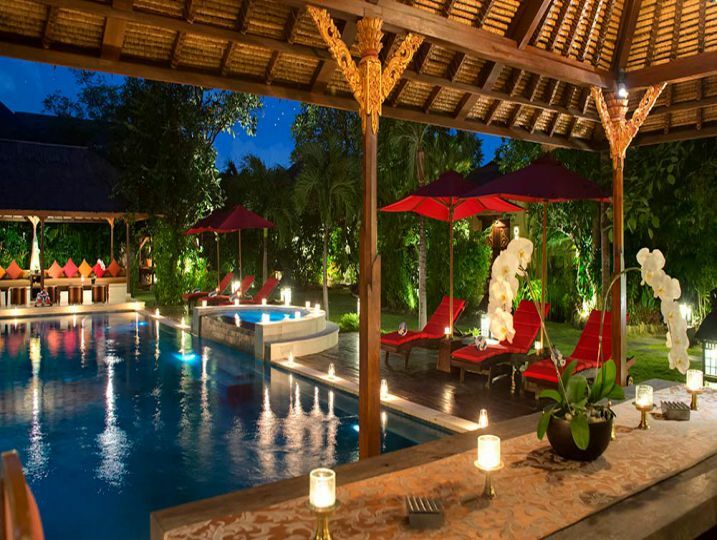 Swimming Pool Area (Private swimming pool, Bale’ (small Balinese gazebo), Poolside sunlounges with umbrellas). Parking and Storage (Private parking). Outdoor Entertaining (Outdoor bar facility). Airport pick-up on arrival, Welcome drink upon arrival, Flower arrangements in the villa upon arrival, Free Wi-Fi, Drinking water, Coffee & tea, Housekeeping service. Kalimaya I + II + III is available for selected dates. 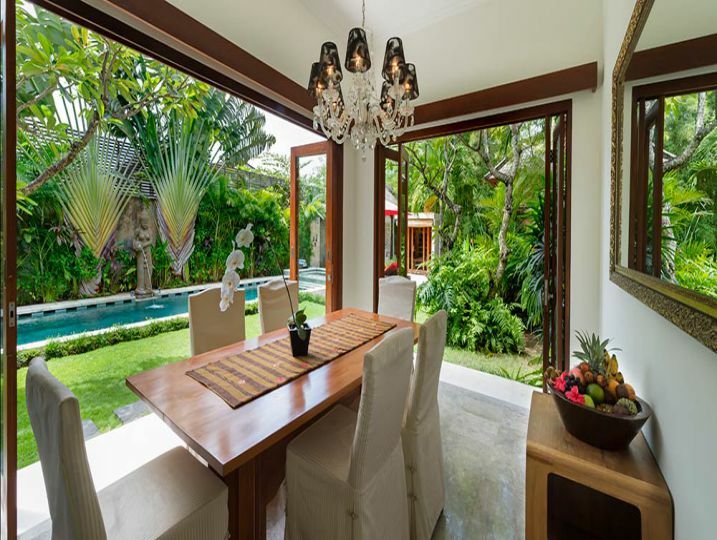 Villa Cinta, 3 Bedroom Villa, Seminyak Villas. 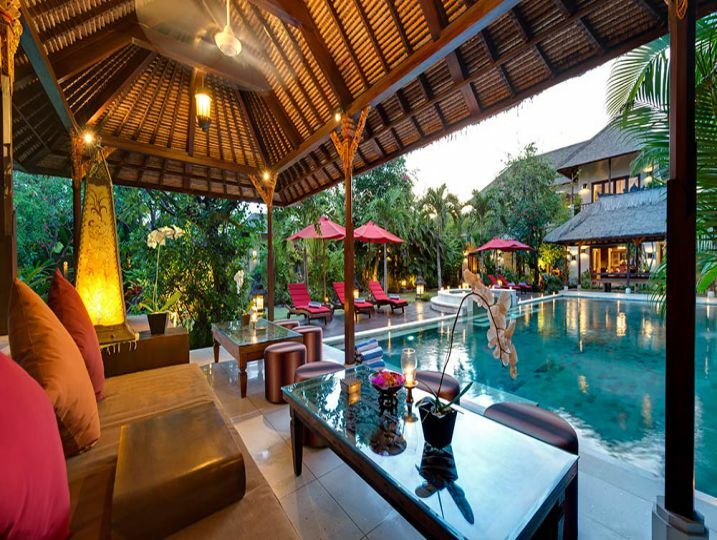 Bali Villa Collections is the holiday villa rental agency you can trust if you’re looking for a perfect place to spend your honeymoon, family vacation, or getaway with friends. Through the years, we’ve built an extensive portfolio of luxury villas which are located in tourist-friendly destinations. 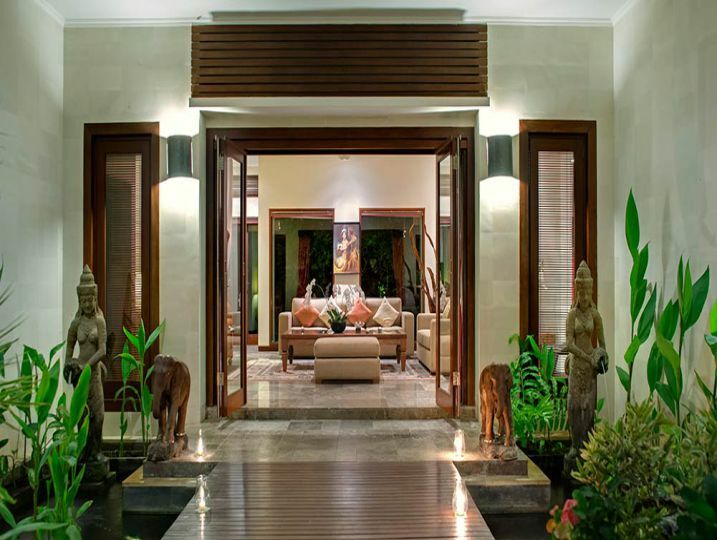 At Bali Villa Collection, we put our clients at the heart of everything that we do. Our ultimate aim is to deliver the very best holiday experience in exclusive destinations and at the best price possible.